The fish is a perfect form. We had the pleasure of attending the opening reception of the Frank Gehry Fish Lamp exhibition at Gagosian Gallery in Beverly Hills. "One of the most celebrated architects living today, Gehry's career spans five decades and three continents. Known for his imaginative designs and creative use of materials, he has forever altered the urban landscape with spectacular buildings that are conceived as dynamic structures rather than static vessels. Gehry has always experimented with sculpture and furniture in addition to his architectural pursuits. 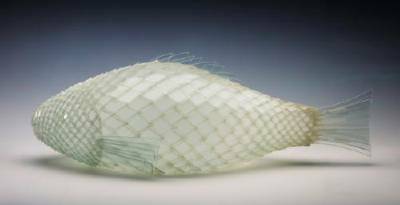 The Fish Lamps evolved from a 1983 commission by the Formica Corporation to create objects from the then-new plastic laminate ColorCore. 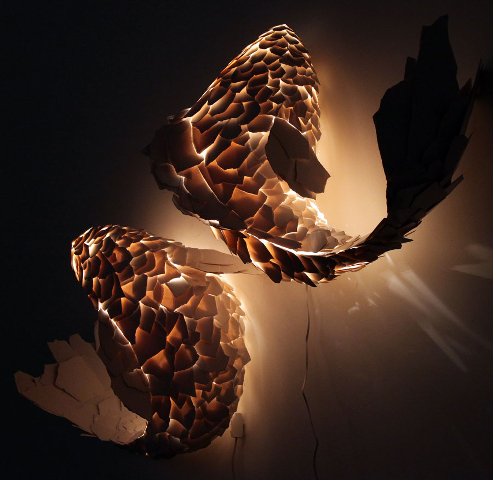 After accidentally shattering a piece of it while working, he was inspired by the shards, which reminded him of fish scales. 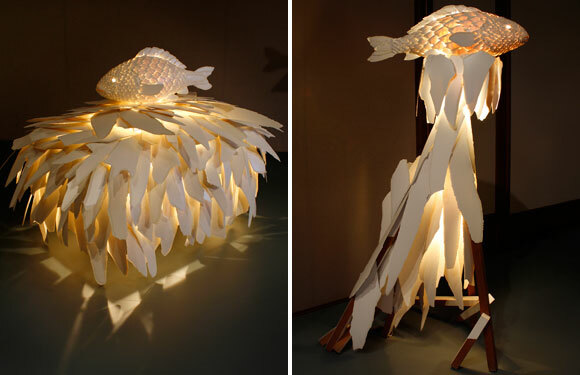 The first Fish Lamps, which were fabricated between 1984 and 1986, employed wire armatures molded into fish shapes, onto which shards of ColorCore are individually glued, creating clear allusions to the morphic attributes of real fish. 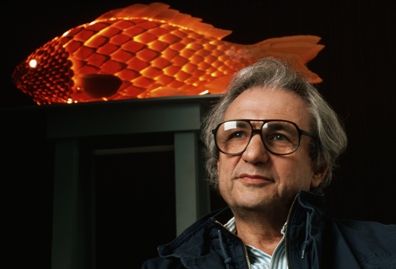 Since the creation of the first lamp in 1984, the fish has become a recurrent motif in Gehry's work, as much for its "good design" as its iconographical and natural attributes. Its quicksilver appeal informs the undulating, curvilinear forms of the Guggenheim Museum in Bilbao, Spain (1997); the Jay Pritzker Pavilion in Chicago (2004); and the Marqués de Riscal Vineyard Hotel in Elciego, Spain (2006) as well as the Fish Sculpture at Vila Olímpica in Barcelona (1989–92) andStanding Glass Fish for the Minneapolis Sculpture Garden (1986). 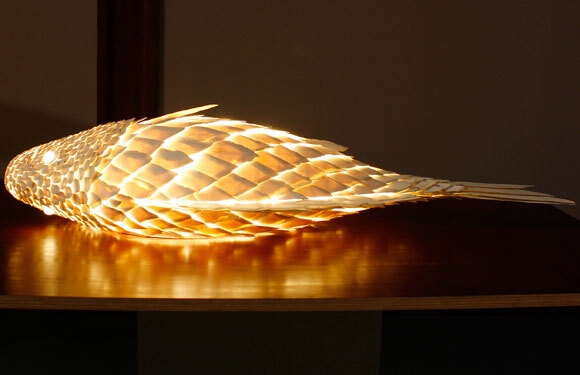 In 2012 Gehry decided to revisit his earlier ideas, and began working on an entirely new group of Fish Lamps. The resulting works, which will be divided between Gagosians Los Angeles and Paris, range in scale from life-size to out-size, and the use of ColorCore is bolder, incorporating larger and more jagged elements. 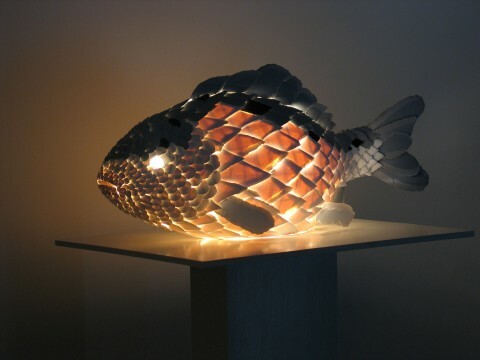 The softly glowing Fish Lamps are full of whimsy. As individuals or groupings of two and three, some are fixed to poles or wall sconces, while others can be placed on any existing horizontal surface. Curling and flexing in attitudes of simulated motion, these artificial creatures emit a warm, incandescent light. This intimation of life, underscored by the almost organic textures of the nuanced surfaces, presents a spirited symbiosis of material, form, and function."